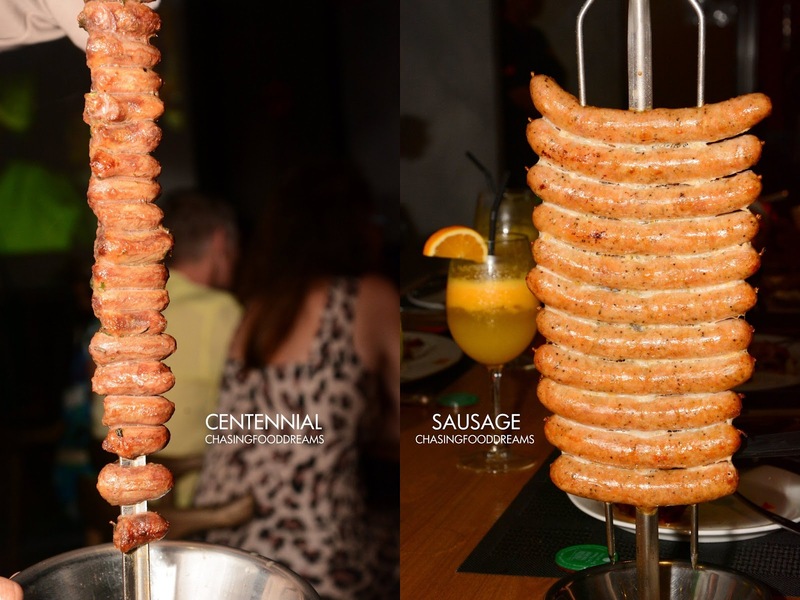 CHASING FOOD DREAMS: Samba Brazilian Steak House Churrascaria, Avenue K: A Fabulous Churrasco Experience in KL! 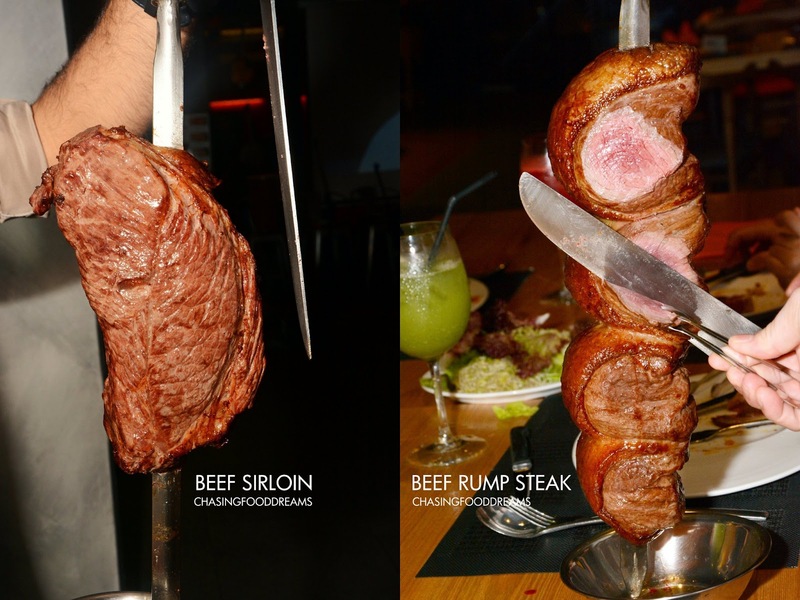 Samba Brazilian Steak House Churrascaria, Avenue K: A Fabulous Churrasco Experience in KL! There’s really very few Churrasco in Malaysia and I kept wondering why. Now we all know we love our BBQ and we love our meat and seafood. So it’s really about time we have a few more churrasco jazzing up our food scene here in our metropolitan city. 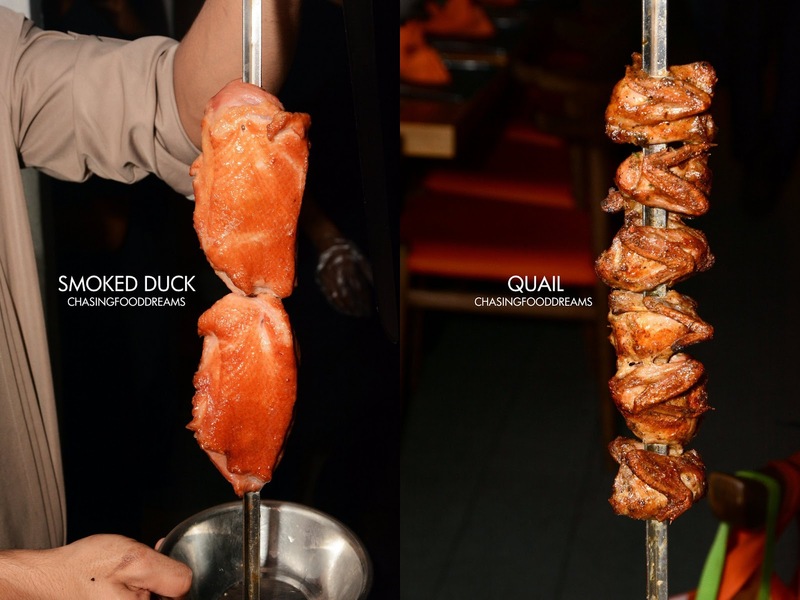 Samba Brazilian Steakhouse may not be the first to open in the city but it certainly has plenty to offer gourmands and foodies who love barbeque meats and seafood. 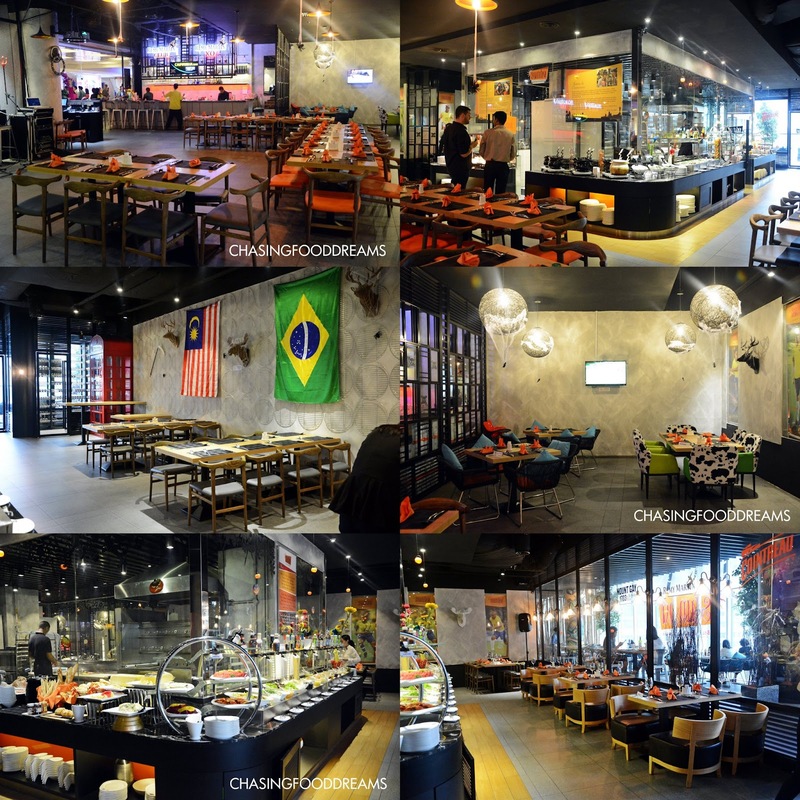 Located on Level 3 in Avenue K., Samba opened in January 2014 officially for business. Taking up a large space at the mall, Samba is set on making a great impression from the moment one walks in. Right up front of the entrance, Samba has a bar which is perfect for hangouts or waiting for friends before an evening of glorious barbecue. Once you stepped in, you’ll be amazed at the space it has from its main area in the center of the dining room hosting the churrasco grill and the buffet spread counters to the al fresco area overlooking the city view. Each section of the dining room also has its own ambience, mixing in raw industrial appeal from its walls and flooring to the mix of wood furniture. There is an open stage area too for live music on some evenings. When we were there to celebrate Roda de Samba, a Brazilian festive celebration, the restaurant has allocated an area for performances. 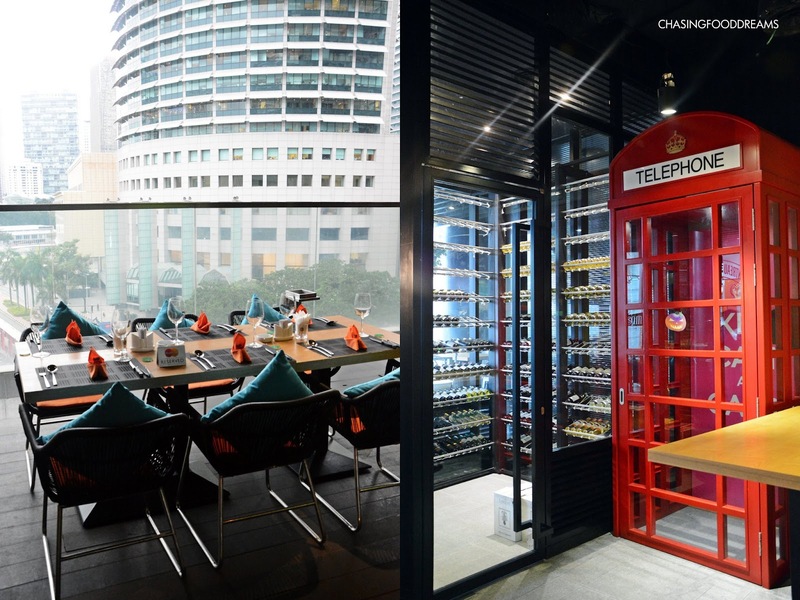 Cute British telephone booth sat next to a glass encased wine cellar. 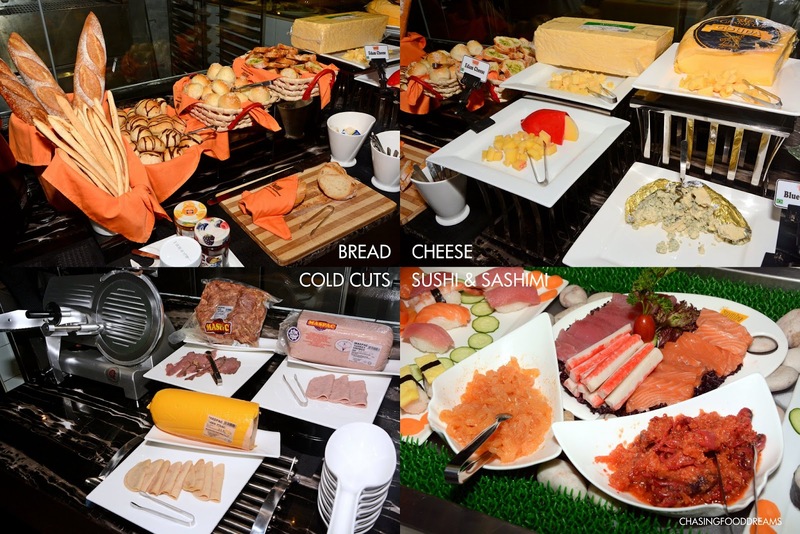 The buffet counters run 360 degrees so one can simply make their rounds to savor the food in an orderly manner. In the middle of the buffet counters is a room where all the barbeque is being managed. One can see the rotating skewers of meat, watch as the fat sizzles away on the coals and be tempted by the glorious smoky aroma of the barbeque. 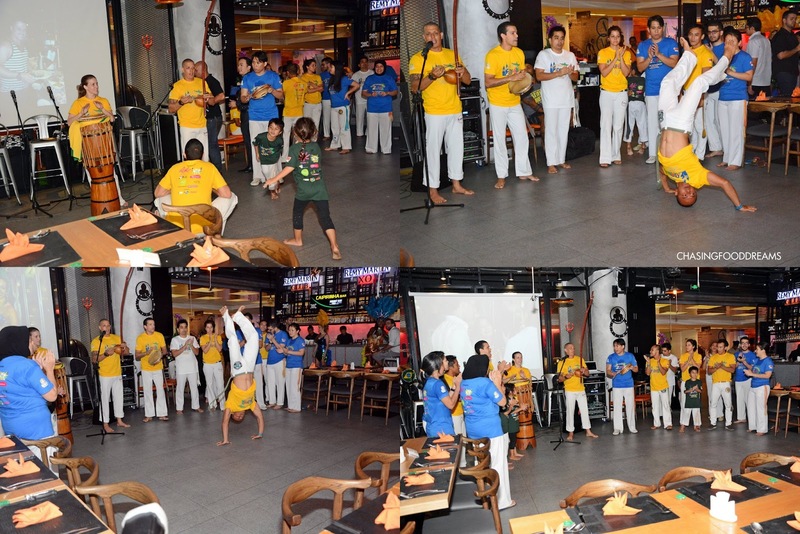 I was there during the Roda de Samba celebration and was honored to be able to see local Brazilians performing traditional Brazilian martial art called Capoeira. This is a very unique combination of acrobatic, dance and music that is practiced by many Brazilians. You can read more about Capoeira here. It was such a sight as everyone from all ages takes turn to throw ginga, cartwheels, tesouras and etc. Since it was a Roda de Samba celebration, we got to experience Roda, where according to Wikipedia, a circle is formed by capoeiristas and capoeira musical instruments, where everyone sings and claps their hands to the beat of the music. Two capoeiristas would enter the ciricle or roda and play the fast martial art game as they try to outdo each other. The most interesting music instrument that caught my attention was this Berimbau, a single-string musical bow that is played in every capoeira. After the performance, we got down to food business. 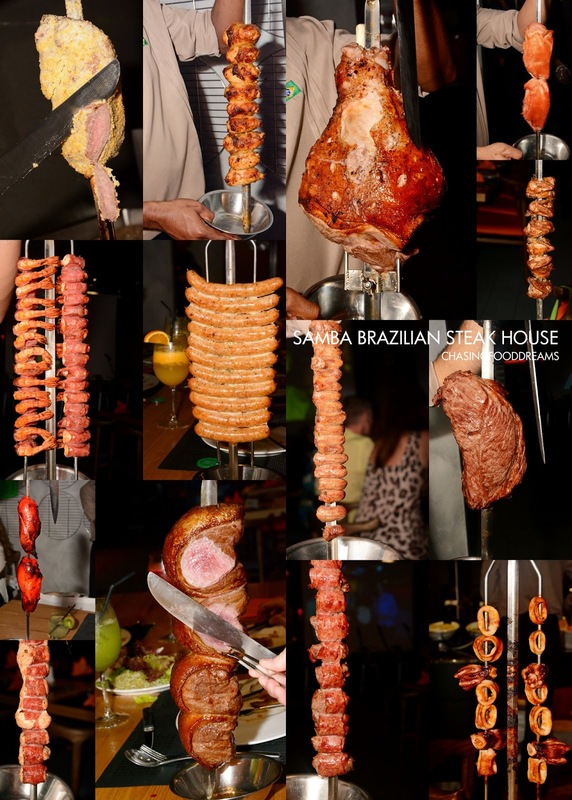 Here’s how it works for Samba Brazilian Steakhouse. 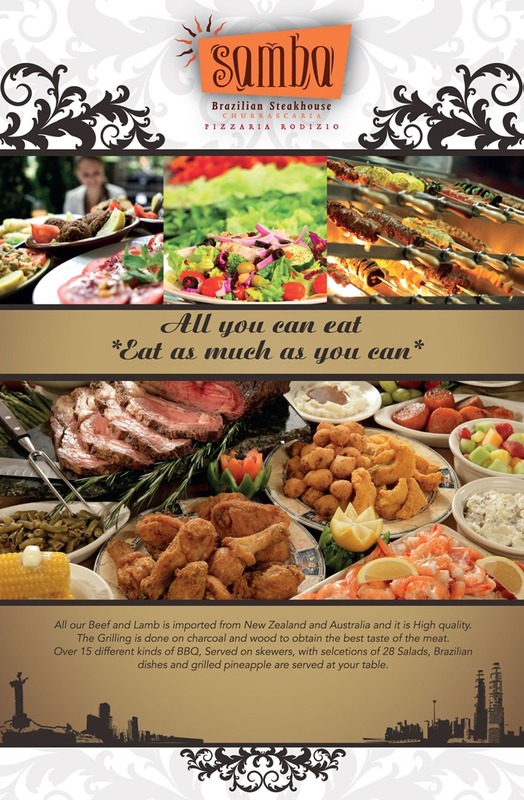 One can choose to go a la carte or simply enjoy their churrasco Brazilian BBQ Buffet. 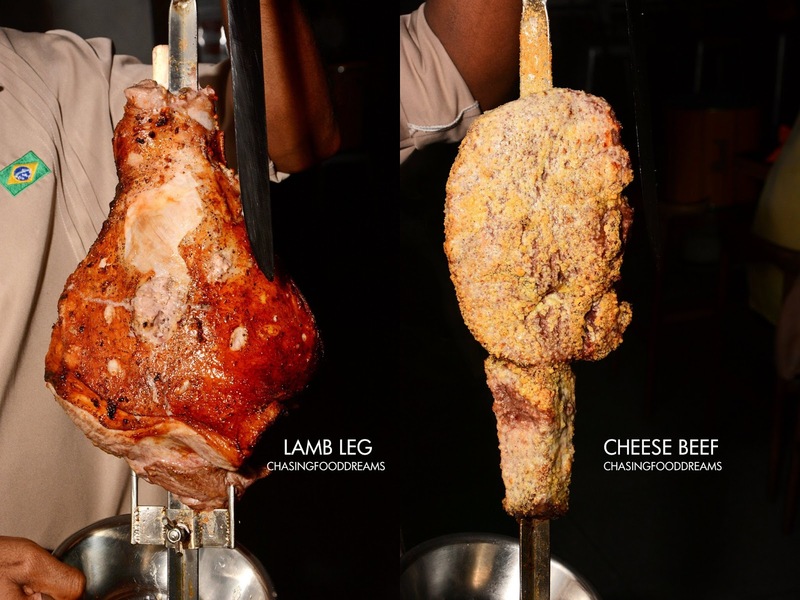 For the ultimate Brazilian Churrasco experience, go for the BBQ Buffet Dinner. Pay one price to savor over 15 barbecue items served on skewers at your table. 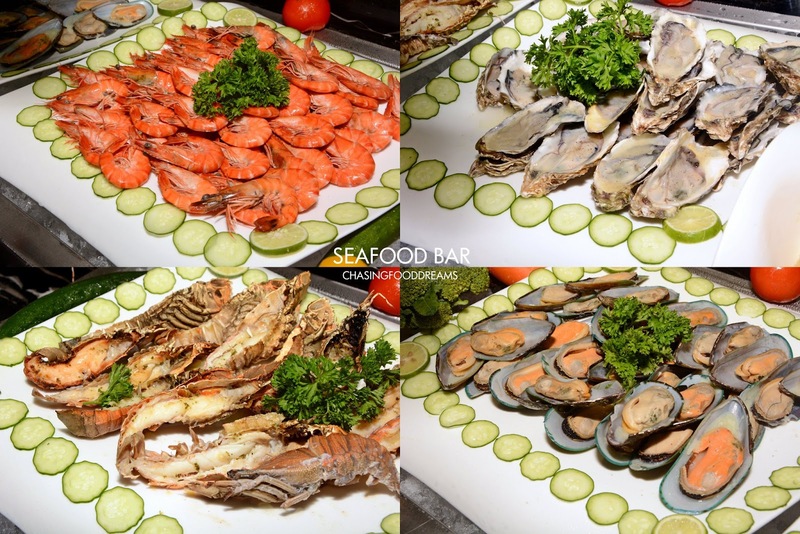 In addition to the barbeque, visit the buffet selection of 28 salads, Japanese Sushi & Sashimi, Seafood on Ice, Cured Meat, Bread and Cheese, Brazilian dishes and desserts. It’s a super indulgence feast and experience. Drinks may or may not be included in the buffet depending on the promotions. First of all, we were told to help ourselves to the buffet spread. It’s really a large spread of dishes. Though I would love to be able to savor every dish, it’s simply not possible and so I only tried Brazilian dishes since I have never had most of them before. Brazilian Farofa or Casava is a famous accompaniment in Brazil and is a toasted yucca or manioc flour mixture. It is almost an essential dish to go with churrasco and is a staple for many as fillers and a good source of nutrients. It has a smoky and salty taste so it is presumed to go well with barbeque meats and stews. There were also Lady Finger Sauteed and Kailan Sauteed. 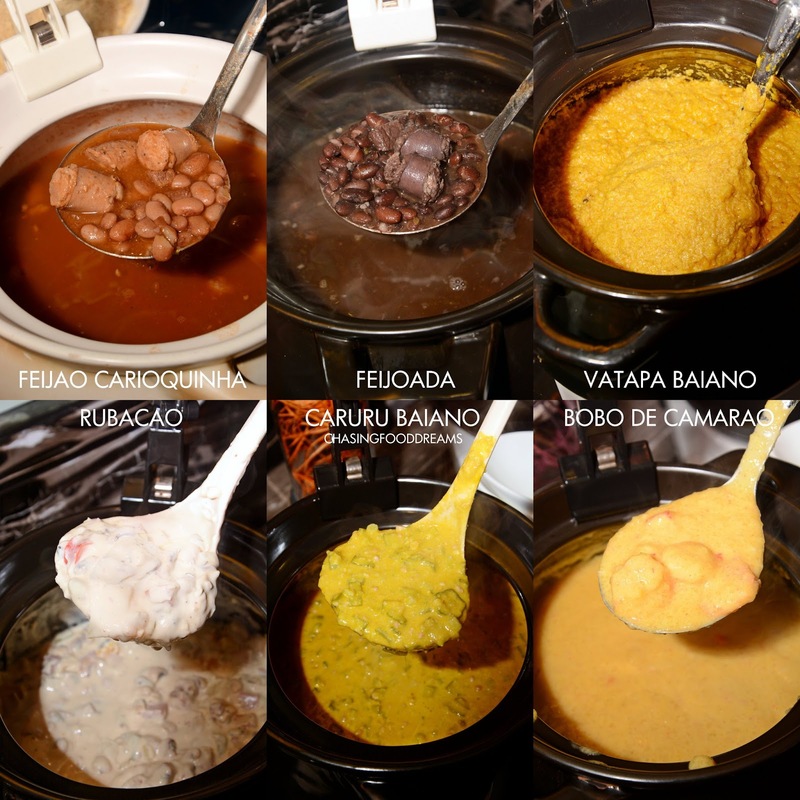 Besides these are six types of Brazilian soups and stews – Feijäo Carioquinha, Feijoada, Vatapa Baiano, Rubacao, Caruru Baiano and Bobó de Camaräo. The famous and national dish of Brazil is Feijoada. I have heard and seen the dish many times on food shows but have yet to try it. Feijoada is a black bean stew cooked with salted beef and pork. The stew is generally savored with rice and sausages. It’s a hearty dish and all parts of the cow or pig are added to give it its rich and meaty flavours with the nutty and creamy black beans. I find the stew a tad on the saltier note but am assured that this is as authentic as it is in Brazil. Vatapá Baiano is made from bread, shrimp, coconut milk, peanuts and palm oil mashed into a thick creamy paste. Caruru Baiano is also another stew made from okra, onion, shrimp, nuts and palm oil. Bobó de Camaräo is shrimp cooked in yucca meal with coconut milk and palm oil. It’s also very creamy and slightly sandy. Rubacao seemed to be made of beans, vegetables and lots of cream with hints of spices. Feijäo Carioquinha is a pinto bean soup cooked in a light tomato broth with meat or sausages. These do not taste very familiar and have a very distinctive taste that may need some getting use too. Out of the six, I happen to enjoy Bobo de Camarao the most. 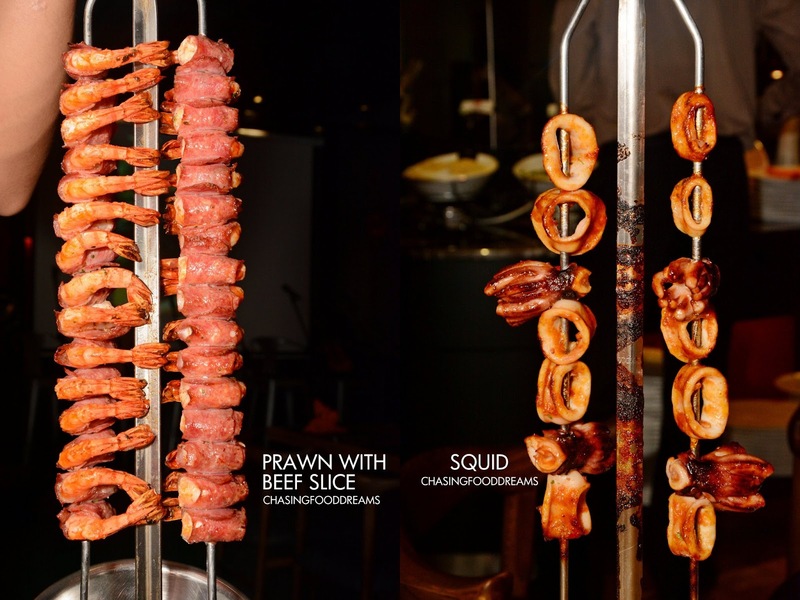 Do try them as it will certainly give you an insight of Brazilian cuisine. Another Brazilian dish worth trying is Acarajé Frito and Bolinho de Arroz. Acarajé is fried dumpling made from peeled and mashed black eye peas deep fried in dendê (palm oil). Brazilians use palm oil in all their dishes to give it the glorious color and flavour. Acarajé is served all over the streets. Favored by many, the Acarajé is split in half and stuffed with Vatapá Baiano or Caruru Baiano. I saw Anthony Bourdain eating this once and he quote that it’s literally a heart attack dish that’s not good for the heart but so good for the soul. I like it plain and find the creamy and nutty flavours very pleasing and yummy. The Bolinho de Arroz resembles Italian Arrancini which is rice ball with a crispy breaded layer. It’s decent too! Roast Chicken is available for those who want to play it safe. 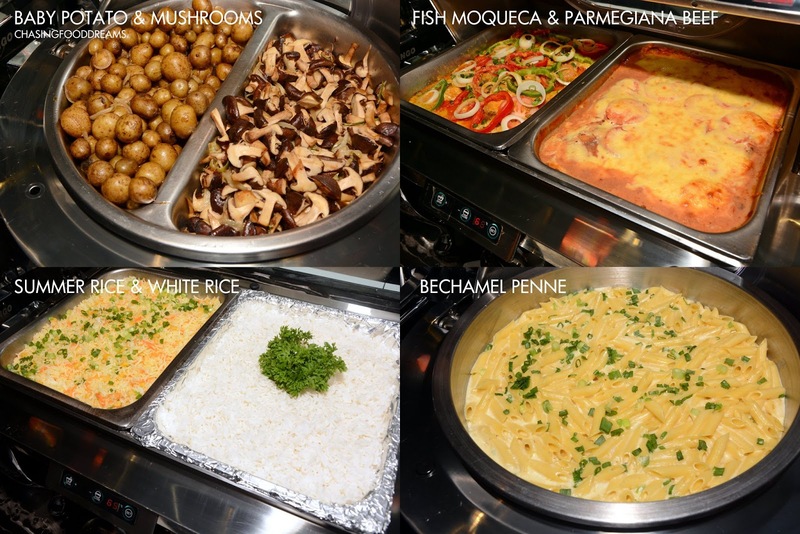 Hot dishes from the buffet warmers had Whole Steamed Fish, Fish Moqueca, Parmegiana Beef, rice, pasta and more which rotates on daily basis. Seafood for those who likes chilled poached seafood or Fresh Oysters. I guess Brazilian loves Japanese as there were also selections of Sushi and Sashimi available. Once you had your fill of the buffet (which you can also go back for more after your barbeque session), it’s time to get down to serious churrasco chow down. Using the Brazilian way of a red and green chip, one needs to indicate if you need more barbeque skewers to be heading your way or if you have had enough. Universal colors, its green for more food please or red for no, I am done. Wait staff were seen scurrying around carrying skewers of barbeque temptations to all occupied tables. That evening, I was simply amazed the amount of varieties we had. Not in any particular order, we started with Prawn with Beef Slice and Squid. Look at how even the barbeque is. Rows of tempting prawn wrapped with beef bacon and grilled with minimal seasoning. The Squid has a lightly savory sweet glaze and was a tad overcooked but the Prawn is so delicious! Besides the prawn and squid, there were also fish but I forgot to take a photo of it. It’s all about strategies and self-control here as one really needs to go slow and savor little by little to try all the barbeque. Next up was Chicken Roll with Beef Slice or Beef Roll with Beef Slice. 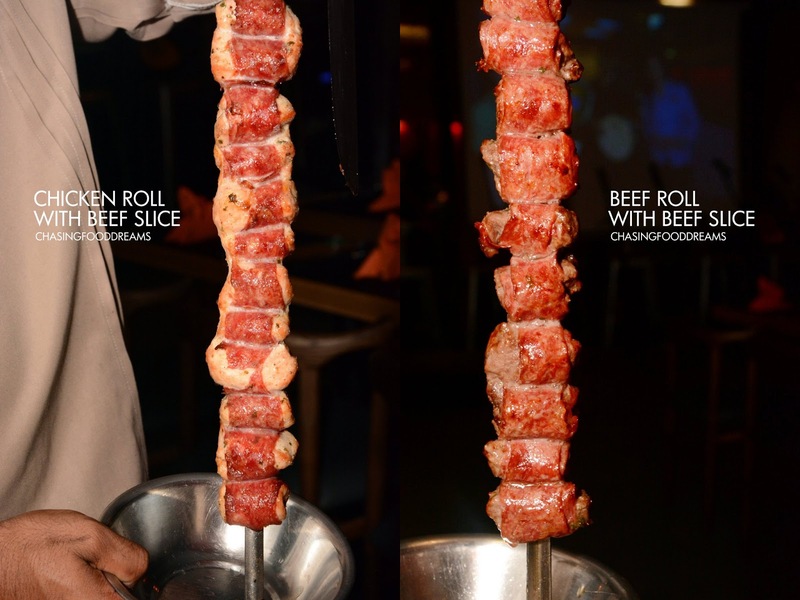 Little bundles of chicken or beef rolled up with more beef bacon and grilled. These are so good that you might not want to stop at one. Juicy and savory, it’s very delectable. The Black Pepper Chicken Sausage is super scrumptious with lots of peppery notes. I shared this with someone but regretted it right away since it was so good. I didn’t have the Centennial or Chicken Hearts. Call me a chicken but I was never one to enjoy chicken spare part unlike the hog ones. 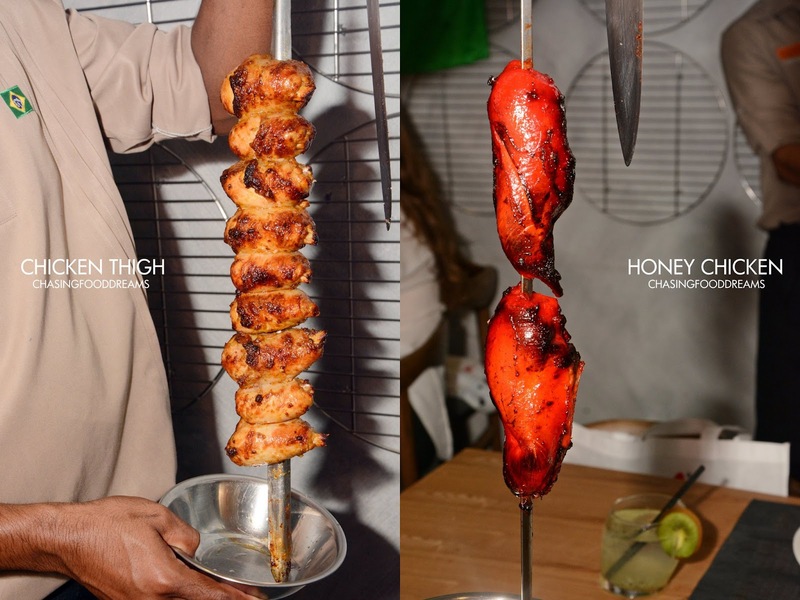 Go for the Chicken Thigh and Honey Chicken and its also a sure pleaser. Though I was a bit worried about that Honey Chicken color, the flavour is so good. Sweet, smoky and savory, it did taste like our char siew chicken. The Chicken Thigh is very moist and well-seasoned. Smoked Duck is the Bomb! Ok, here I lost control and took on quite a few slices of the Smoked Duck. Crispy fat rendered skin with super juicy plump duck breast meat is just irresistible in flavours. The salty edge of the salt took the duck flavours to another new level for me. I kept raving on and on how good this was and also kept spying the waitstaff carrying the duck for more encore. The Quail is decently grilled with a good pink tenderness. The next following barbeque is what more carnivores dream about… Beef Sirloin, Beef Rump Steak (Picanha), Lamb Leg and Cheese Beef. It’s the epitome of a meat lover’s fantasy. I simply cannot find any fault with the beef. Glorious premium cuts of sirloin and rump steak is heavenly seasoned with special salts and grilled to a glorious smoky char note. As the wait staff slice the sirloin and rump steak to unveal the juicy pinkness of the veal, we all watched in awe of the beef and the juices dripping on to the plate. The Cheese Beef is made even better as it is crusted with a heavy strong cheese that gives the beef a creamy and salty edge. I wanted more of the Cheese Beef too as I enjoyed the beef and cheese flavour combination very much. The Lamb Leg has a stronger meat flavour which I did not enjoy as much as the beef but it was still a very good barbeque as it was succulent and tender. In addition, I had enough to keep me superbly happy with everything else. The piece de resistance of the night had to be the humongous US Beef Ribs. Man, these are almost like dinosaur ribs in size. There is even a special barbeque grill for this monstrosity. It has to sit upright and slowly turns to evenly roast from the heat of coals in the center of the pit. These were wheeled out to us. These manly US Beef Ribs is super succulent despite it being so meaty and lean. They were also tender and beautifully beefy in flavours. The endless possibilities of the ribs, imagine them in sandwiches, soups, stew or simply enjoy them the way it’s meant to be here in Samba, grilled to perfection. OK, by now I really wanted to surrender gracefully… then I saw Cheese Bread being served to the tables. It’s my first time trying these Brazilian Cheese Bread and boy, these were so awesome. The doughy balls had a lovely chewy texture and a strong cheese flavour. As soon as I tried one, I automatically reached for another and another… make sure to savor these piping hot! Then came grilled Pineapple… ok so maybe just a tiny slice… make sure to have them sliced the grilled part for you so you get that gorgeous chargrilled caramelized pineapple flavour. 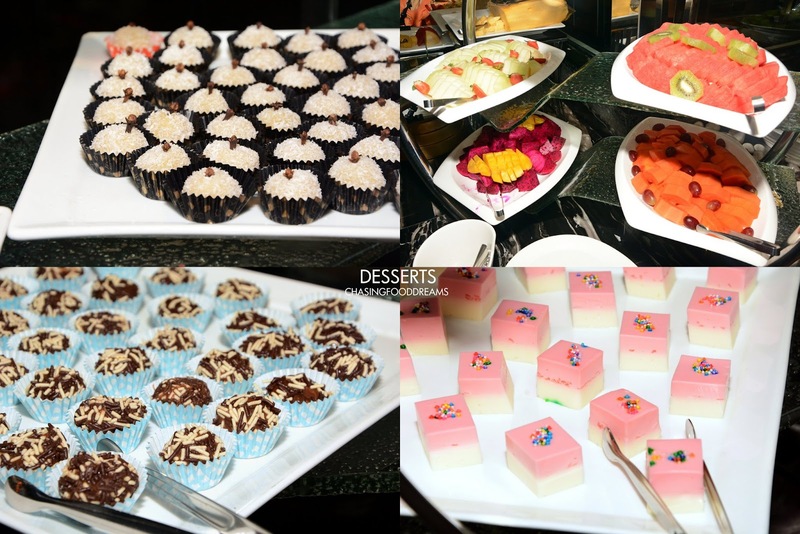 If you think you still have room, check out their dessert bar filled with a selection of Brazilian desserts like Pave de Chocolate, Passion Fruit Mousse, Arroz Doce and more. I only tried the Passion Fruit Mousse because I was just too full to even eat anything else. Samba Brazilian has lots of beverages to offer and that evening, we had fruit juices and cocktails. These are not included in the buffet. We had this awesome Brazilian Cachaca, a national distilled spirit of Brazil made from sugarcane, cocktails – Original Caipirinha, Strawberry, Kiwi, Passion Fruit and Strawberry with Passion Fruit. These are delicious and potent stuff! We managed to meet the owners of Samba Brazilian Steak House together with the chef responsible for all the authentic Brazilian dishes.